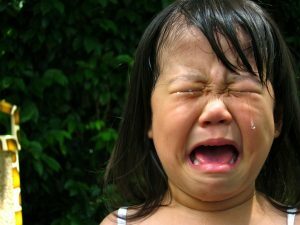 » Are toddler tantrums a serious ethical issue? Toddlers often seem to undergo what look like extreme negative emotions, raging, sobbing, and genuinely seeming massively distraught because they, e.g., can’t have a second cookie. Generally speaking, parents don’t feel too awful about these episodes, regarding them as regrettable but inevitable, and sometimes even funny (see, e.g., this link), and something to be managed in the course of development. That’s not because we don’t care about toddlers, of course – if they were sick or in pain we’d be really concerned. Nonetheless, I think if we saw an adult undergoing extremes of negative emotion of the kind that toddlers go through on a daily or weekly basis, we’d be pretty upset by it, and regard it as something to be taken seriously. Perhaps that’s partly because we’d assume that the adult had ‘real problems’ . However, here’s where I start to worry about whether our intuitive reactions have a firm theoretical basis: on the face of it at least, hedonist or desire satisfaction accounts of well-being would seem like they should take extreme negative toddler emotions just as seriously as adult ones. They seem like real intense negative emotions, and they’re underpinned by real desires. Every toddler, then, could turn out to be a kind of negative utility monster. So is it a genuine ethical catastrophe that toddlers are constantly getting stressed out about random stuff? Of course it’s a normal and probably inevitable part of development, and I’m not personally worried as a parent, but I do find it philosophically interesting to think about how we adjudicate well-being in these cases, and whether there’s a good theoretical basis for taking this form of toddler suffering so lightly. And while there’s probably not much to be done about this form of toddler suffering at a macro level, you might still think philosophy can contribute to our individual practice as parents. For example, imagine that my toddler wants to stop at the park. If I accede to his demands, it’ll take up a bunch of my time and it’ll mean that I have a long stressful evening of grading. However, by doing so, I could avoid a very intense 30 minute tantrum on his part. Could it be ethically wrong for me not to stop off at the park? (1) Maybe I’m wrong, and there’s a good way to show that what look like extreme negative emotions in toddlers and little kids aren’t really all that intense or unpleasant. (2) Even if toddlers’ emotions are real and intense, maybe there’s some further important distinction to be drawn between serious negative emotions in adults vs. kids. Duration seems a good candidate here – toddlers have notoriously short attention spans – but I wonder whether this fully satisfies the concerns above. (3) You might also dispute whether there really is an asymmetry in our reactions to adults and children in this regard. Maybe we don’t actually treat comparable adult emotions any differently. Even if this is correct, however, there remains a cluster of interesting ethical issues here, such as how seriously we should take tantrums in our own ethical reasoning. Great issue! I might add this to my suite of arguments that what we really do/should care about are outcomes rather than emotional experiences per se.